It's time to make your deposits for our 2016 Guild retreat. Please be sure to have read all the information before making your payment using the drop down menu at the bottom of this post. 1) The Franciscan has expanded our block of rooms and we can accommodate all members who answered the retreat survey, as well as a small number of guests, at the 2016 retreat. Guests of SMQG members will room in a double room with the inviting member, and requests will be handled in the order received. If you have interest in inviting a guest, please email Jess directly at jessicabenoitmay@gmail.com. 2) Deposits to hold your room reservation are due by January 2. This PayPal button will be posted on the blog from December 27 through January 2nd for you to make that deposit. If you have trouble with PayPal or prefer to pay by check, Jess can accept checks at the January 2nd meeting. Please let her know before the meeting if that's what you intend to do. 3) Please do not pay a deposit for the retreat at this time unless you are current 2016 member. This includes any potential guests. Priority will be given to members who pay the deposit between December 27 and January 2. After Jan 2, we will accommodate guests and late members on a first-come first-served basis until all rooms in our block are filled. After our rooms are filled, interested parties will be wait-listed and notified in the case that a room becomes available. 4) The $30 deposits for the 2015 retreat are non-refundable. In the event that you have paid for the remainder of the cost of retreat and are unable to attend, any money that is refunded by the Franciscan for the cancelled spot to SMQG will be passed on to the member who cancelled; however, the Franciscan is not required to refund us for last minute cancellations. If we are able to fill the vacant spot with another quilter, the cost of the retreat minus the $30 non-refundable deposit will be refunded to the cancelling party by SMQG. 5) If you are sure that you want a double, but haven't found a roommate yet, still select a double for your chosen number of nights. In the "Rooming with" field, say "Looking." Our January meeting will be held in a new location, the Durham Public Library in Durham, NH. It is located at 49 Madbury Road. There is parking in the lot, and also more parking across the street at the Oyster River Middle School. The library opens at 10 a.m., so we will not be able to get in early to set up, but we have the space for an extra hour after the meeting. The meeting room is on the second floor, and there is an elevator! Our goal for this meeting is to make as many blocks as we can for a great charity brought to our attention by Judy. They are accepting old or new blocks. This is going to be a great opportunity to gather up any orphan blocks you may have lost interest in so they can be given new life. And any quilt tops that are just gathering dust will also be greatly appreciated. Blocks can be in any color, fabric, or style. They must be larger than 5". These are just some ideas to get you started, because when you can make anything, it's hard to settle on one thing. We are always looking for people to bring ironing boards, irons, and large cutting mats. Please email Mary (seemaryquilt@gmail.com) if you'd like to volunteer. End of the year business items began with the announcement of the 2016 Officers. Thanks for volunteering to serve! Laura announced a guild pricing discount for the Mighty Lucky Quilting Club from Lucky Spool. This is a monthly design skill builder club. Laura has sent an email to the group asking who would like to participate. If you haven't responded yet, please send Laura an email. Our retreat at the Franciscan in Kennebunkport April 14-17 will come up fast. We're finalizing the details on how many the facility can accommodate and will let everyone know how many members and possibly guests we can have. A $30 deposit will be due in January with payments in Feb. and March. Judy collected mini challenge quilts to be displayed at the West Newbury Library's fiber exhibit in January. If you have a mini still, you can contact Judy about getting it to her. The guild received a lovely thank you note from the raffle quilt winner, Sue Frewert, a member of the Bedford guild. The Kite Tails appeared at the next Bedford guild meeting for show! Our next meeting will be on January 2 at a new location - the Durham, NH Public Library. 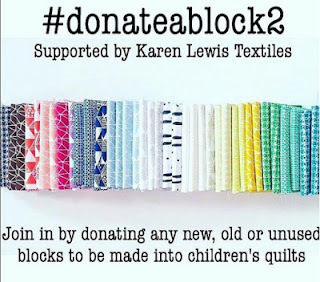 We will be doing a charity block sew-in for two Children's Hospital in Boston and another in the UK. 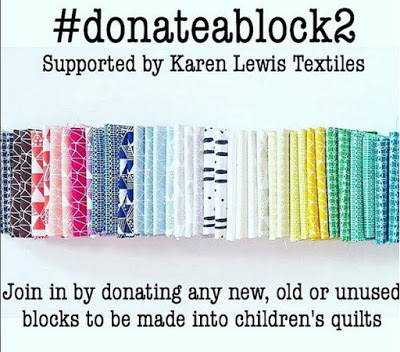 We will be sewing blocks only for babies and young children. More details to follow. The finished Quilt Con 2016 Charity Quilt was revealed! Our "improv with intent" winter scene glowed and popped with the made fabric layout and stunning quilting (Thanks Mary!). A minor bleed through that was painstakingly attended to by Jess and Mary was deemed not an issue so it's off to Pasadena to bring a breath of New England air. Judy presented Laura with the block's made by guild members as a thank you for her year of serving as President. You did a fantastic job Laura. Many thanks. Judy made the sewing tote for the presentation. Our annual year end celebration was a smorgasbord of tastes and delights both sweet and savory!! Peanut Butter and Jelly Cake, Artichoke Arugula Souffle Bits, Sour Cream Coffee Cake (recipes at the end of the post) were only some of the delicious fare. Sue had a handmade sweater with super cute buttons. Susan has a friend who likes orange and a willingness to try new techniques on projects. She showed her tie-dyed inspired quilt for her son-in-law. She also made a quilt top from the City Quilt book by Cherri House. Stephanie accented the mermaid with pebble quilting, making her pop out of bubbles. Sarah showed a joint project she's working on with her grandmother. The embroidered labels are courtesy of Grandma and Sarah is assembling the quilt. A beautiful Sweetwater design. Laura finished her mid-Century modern inspired quilt with palette courtesy of the Liberty binding. Her Do Good Stitches quilt is complete and she's aching at the thought of sending it off. Robin made foxes for her grandson. Notice anything out of the ordinary there? Even the back had foxes. Diane showed a wonderful wedding present for friends. A project with spirals and couching. Nancy won a box of FQs from a vendor! Judy showed a non-traditional Christmas wall hanging with made fabric tree silhouettes. New member Kathy Berkeley showed her Gathering project from Latifah's class. She interpreted the herringbone block without a pattern in bright lime greens. Kathy had some great stars from a template pattern. Jess made a thorough study of the Michael Miller Challenge rules and applied them to what was at hand... resulting in two "challenging" Michael Miller solids in grape and tangerine to go with the focus fabric. The puffy batting is tied with various embroidery flosses - fluorescent and otherwise. The back is pieced with every bit of Michael Miller that was found in her stash. Mary's Michael Miller Challenge quilt has a very different take on the rules than Jess. Mary showed her Glamp Stitchalot blocks. Laura unveiled her Kona Name matching game. Sarah was the first brave contestant to play. Thanks everyone for an amazing and productive 2015. Looking forward to 2016! Combine topping ingredients in a small bowl and set aside. Cream together the oil and sugar. Add the 2 eggs and mix well. Combine sour cream and vanilla and set aside. Alternate adding dry ingredient mixture with sour cream mixture, mixing well after each addition. Pour half the batter into a greased, floured tube pan. Add half the topping mixture, distributing evenly. Top with the rest of the topping mixture and pat gently. Bake at 350° for 45 min – 1 hour. Cake is done when a tester, inserted at thickest point comes out clean. In food processor, pulse scallions, garlic and arugula. Add artichokes - pulse. Whisk eggs and add with cheese and spices. Pulse to mix. Pour into 9" greased pan. Sprinkle with salt. Bake in 350° for 30 minutes or until knife comes out clean. Serve warm or refrigerated. Our December meeting will be held this Saturday, December 5, from 10 am to 12 pm at the Stratham Public Library in Stratham, NH. Please bring any show and tell you have to share with us this month. If you signed up for the Lined Drawstring Bag Swap, please bring a drawstring bag made for your partner and filled with no more than about $15 worth of sewing-related goodies. The tutorial for the drawstring bag can be found on Jeni Baker's blog, HERE. Please either "wrap" your bag in a non-Christmas gift bag and tissue, or add a tag to the bag so that we know who the bag is for and from. Mary will collect all the bags on a table at the beginning of the meeting so we can admire them and we will open them together later in the meeting. We will be sharing a potluck brunch buffet in celebration; please bring a treat to share with the group. We will not be holding the Yankee swap we have held in years past. Look forward to other games, treats, and fun at this meeting! Looking ahead to January, we will be having a charity quilt block sew-in at the Durham Public Library in Durham, NH on 1/2/16 from 10 am to 12 pm. Our November business meeting was held at the Newmarket Public Library last weekend. Laura opened with a thank you for all the volunteers, quilts and hard work that went into The Gathering show. She is working on getting some photos up here and a blog post. We made over $300 (way to go Sue and SueAnn - our rainmakers!) which covers the making cost plus other show expenses. QuiltCon Entries are due on Nov 30! Work on them in advance and save your information to a document before submission. The website gets bogged down and buggy on deadline day. It is $30 per three entries and payment is needed for Michael Miller and triangle challenge entries. Our January activity/venue is up in the air; possibly Newmarket again or Stratham. Laura is looking for a volunteer(s) who will be in town on 1/2/16 to run a workshop. Anyone game? In December we will be in Stratham for our annual End of the Year potluck and celebration. Bring a brunch item to share and your drawstring bag for swapping. Any ideas for an extra “fun” game? Laura played the Kona name matching game that Kaufman did at quilt market and thinks this could be set up. More ideas are welcome and there are a few remaining prizes to give out! QuiltCon Charity Challenge Quilt update: Laura had contacted the Jeannie Geiger Center but hadn't heard back from them. We discussed some other donation options such as HAWC on the North Shore or MAEMMS house in Haverhill. The finished quilt needs to be shipped to Pasadena after the December meeting. Judy let us know that she's been talking to the librarian at the West Newbury library (across from the Old Town Hall) about a fiber exhibit in the library in Jan-Feb. They are collecting items in December and are very interested in getting work from our guild because we meet in West Newbury. Minis would be a great addition. Judy will have more details shortly. Jess had our Retreat/Treasurer update. Deposits will be due in January with payment installments in Feb. and March.The dates are April 14-17 and the Franciscan is offering the same pricing as last year. Kali brought up the Mary Fons webinar tonight (!) Nov. 19. Mary Fons is good speaker. And if you miss it live, you can watch it from the MQG website afterwards. Our annual election took place on 2016 officers and some bylaw revisions. Final results to come shortly. Suzanne showed off a completed wheel chair charity quilt from our Jelly Roll Race. She also found some hand sewn mini blocks from a handful of decades ago. Bea had a gorgeous finish for her bed with this pastel star beauty. Kate Kim's daughter Lucille joined us to debut her first finished quilt. Way to go Lucille!!! Pretty in Pink indeed. Kate also had a finish with a lovely lap quilt in cool purples. Allison made this panel (three more to go!) at Latifah Saafir's class at The Gathering. She also did some pattern testing for The TartanKiwi with this fierce paper pieced cat. Sue had completed a shop sample of Urban Cabin (Atkinson Designs) in soft, smoky hues. Nancy also had a finish from a Latifah Saafir class - a pillow with zipper. Also ooh and aah worthy is her runner up in the Texting While Sewing Contest on Amy's blog. The pattern is Mega Bow Tucks from Quilt Illustrated. Nancy took a Jacquie Gering workshop and has a slash and insert top. And just to show us all up with her productivity, a super colorful and lovely bed size wonder! Laura had a finished quilt from blocks she inherited from a Do Good Stitches circle. And an applique lovely in complementary orange and blues. Mary has a Halloween in progress piece with the cutest ric rac accents. Jess is working on a clamshell in purples, that blended nicely with her handmade skirt in Joel Dewberry purple swallows. This picture does not being to do justice to the wonderous creation that is the Lizzy House cat bra!! Songs will be sung of this at future guild meetings. Colleen showed her Alison Glass and Essex Linen in progress piece. Paula showed her Triangle Challenge for QuiltCon. Diane had two QuiltCon challenges - Triangle and Michael Miller Glitz challenge. Jane, a new member, has a happy, sunny quilt top with some spectacular border to attach. Marylee had two quilted bags that start off as a square, some kind of origami voodoo and it's a purse! Alison did a Quilt As You Go (QAYG) demonstration with some low volume blocks from the Boston Modern Quilt Guild. She showed the sashed back of her picnic quilt and demonstrated that technique.